Charlotte Moss is not only a celebrated decorator and prolific author but a consummate and creative hostess. And although the title of her tenth book, out this week, may be Charlotte Moss Entertains, she actually eschews the term in favor of something less formal, less intimidating and definitely more fun. For what is more pleasurable and satisfying than hosting a meal or party for friends and family. 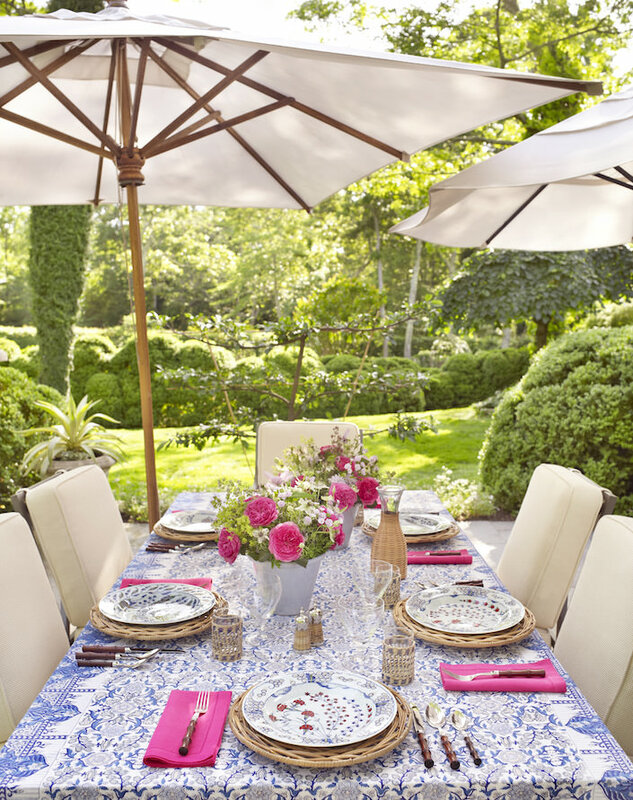 As Charlotte espouses, “setting the table is everyday decorating” and we heartily agree! 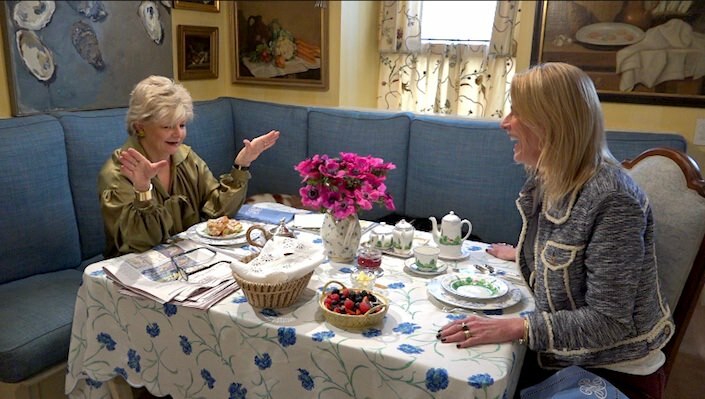 So please join Susanna and me for a behind the scenes video visit with the accomplished, wise and always resourceful author in her beautiful NYC home, as she shows us how, with minimal effort, we can make every day an occasion. 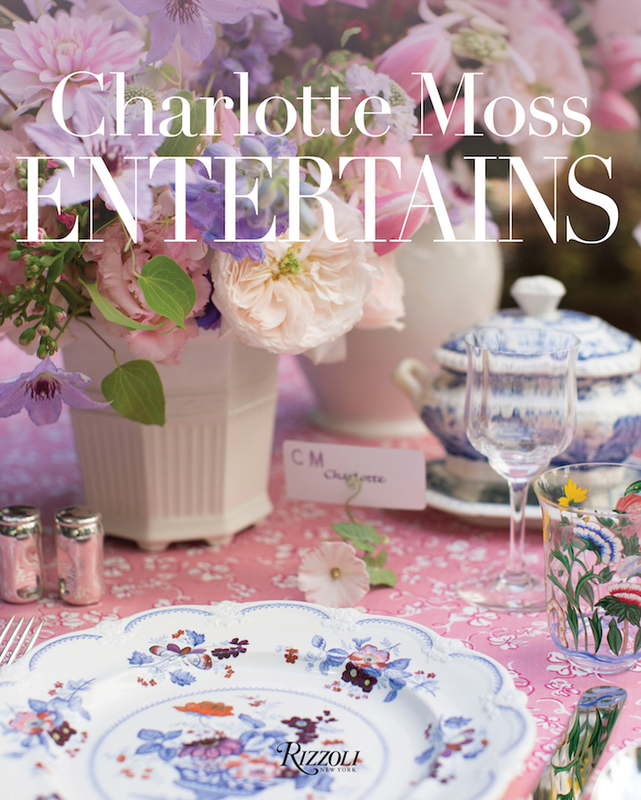 Including a plethora of examples from her own homes, memorable meals on the road (from New Orleans to Scotland to Florence), to holiday traditions and lessons from legendary hostesses, Charlotte’s new tome offers endless ideas for developing your own personal entertaining style. Whether breakfast in the city, dinner in her Hamptons garden, or small moments in between, Charlotte Moss Entertains has a wealth of inspiration. Charlotte’s educated eye finds inspiration everywhere to enhance her tables, from a vintage blouse printed with watermelon slices (the pattern later translated into a tablecloth) to unique finds on her travels to specially commissioned pieces from artists and artisans. 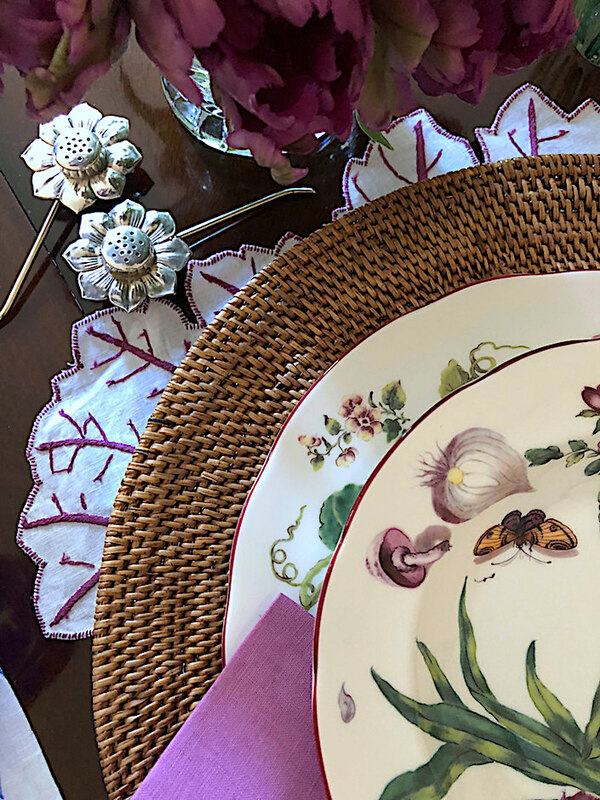 As you peruse her luscious table settings, collections of linens and china and even some of Charlotte’s favorite menus and favorite recipes, you’ll be well equipped to create memorable occasions of your own. And while you’ll certainly want Charlotte Moss Entertains for your library, Charlotte prepared a set of ALL NEW settings for us to shoot in the video, peeks above and below, that are not featured in the book! So get ready to made every day an occasion – and thank you Charlotte, you are, as always, an inspiration! This entry posted in books, entertainment, interior design, Quintessence video series, Setting the Table, Stylish Shopping, video. Entry Tags: charlotte moss, Decorating, design videos, interior design, setting the table, Video Bookmark the permalink. Susanna, once again a great one. I just love your videos. Everything filmed so beautifully and your presence is just so “real.” Thank you! Thank you Patrick! So glad you enjoy Susanna’s and my videos! Thank you Beth!! Charlotte is both practical and inspiring! thank you for always the best video’s, I watch them over and over again, they bring so much joy and beauty. Thank you for showcasing Charlotte’s beautiful tabletop design and her lovely homed (not to mention her 2 Cavaliers, which I also have). Thank you for once again giving us a view into her lovely world. Thank you Cindy! So happy you enjoy the videos enough to rewatch and Charlotte’s cavis are indeed adorable – they were included in Susanna’s book Dogs and Their Designers! A memorable visit to tabletop heaven! 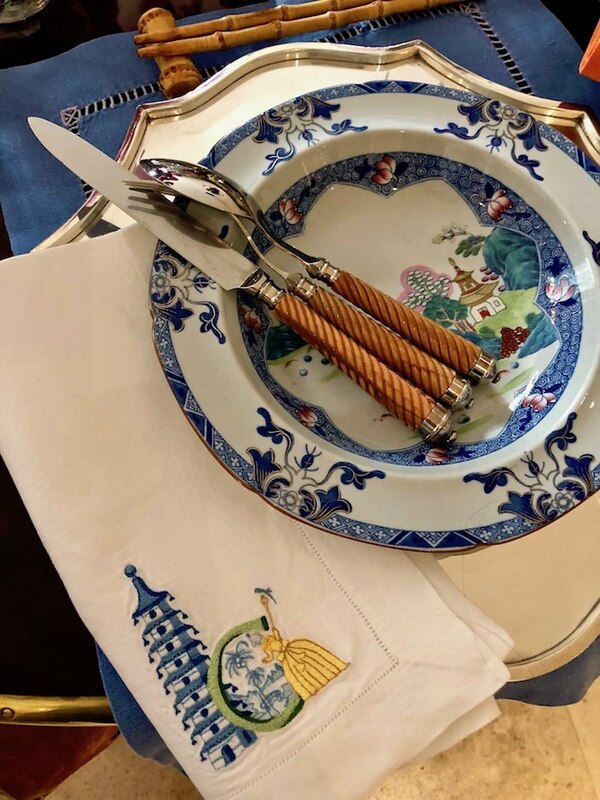 What a fabulous video with gorgeous shots from the exquisite embroidered napkins and the pagoda s/p shakers next to the chopsticks to glimpses of her home (that staircase!). And I’m so glad Susanna asked about how many plates one should buy! Thank you – Quintessence never disappoints. Thank you Elle! Charlotte helps us all remember that every day can be an occasion! Thank you Angela! And you will love the book! Thank you thank you ! Just can’t get enough of C Moss. Your presentation is just lovely and beautiful! Much appreciated. Charlotte is an inspiration! So glad you enjoyed! 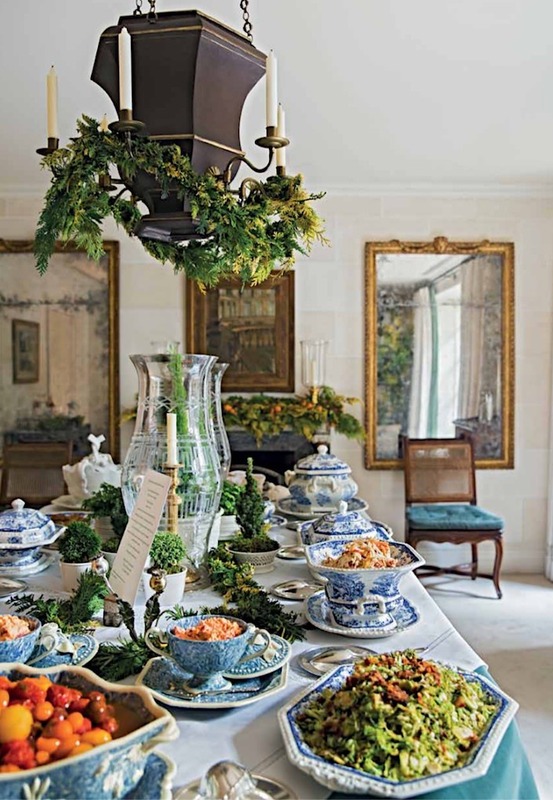 Charlotte Moss is exquisite, and she makes the world of decorating and table setting so approachable (first and foremost!) and then doable!!! She has inspired me for years, as have both you and Susanna. It is your unique collaboration and singular talent for noting the basic design elements within the extraordinary vignettes that you show us that makes Quintessence the absolute best blog! My home is so enhanced by your lovely work, and I am grateful to both of you for bringing such inspiration to so many. Charlotte Moss: My Design Super Hero. This was just so darn beautiful, it made me teary. What an eye. From the wonderful linens, the antique porcelain mixed with new, the table accessories, the cachepots, simple, thoughtful touches, it was a lovely treat. Thank you for brightening my morning. OFF to watch THE VIDEO! I met her once……..LOVELY WOMAN! WATCHED IT AND LOVED IT but NEED to KNOW what does her Gold bracelet say………THAT is a BEAUTIFUL STATEMENT PIECE!Is it a quote or an anniversary gift………..? Also, her flowing blouse is SPECTACULAR! So enjoyed this video visit and picked up some creative tips for using things in my collections as part of a table setting. Many thanks! I could watch this over and over again! I bought her book it is lovely. Thank you so much for these amazing videos! 85 queries in 1.154 seconds.